Nigiri sushi first appeared in Southern Asia. Fish was cut up, placed in layers, sprinkled with salt, and clamped in stone press. After several months of fermentation, the fish was ready. Nowadays, some restaurants in Japan still offer clients this kind of sushi — it is called narezushi. At some point, one talented chef by the name of Yohei decided to remove the process of fermentation and opted instead to serve sushi with raw fish — in its present form. A little later, two different styles of preparing sushi emerged. Kansai was a style from the Osaka city, Kansai area, and Edo style came from Tokyo (Earlier Tokyo was called Edo). Nigirizushi style is a piece of fish on a small lump of flavored rice. Kansai sushi is much more difficult to cook, and only a small percentage of Japanese know the right recipe. Today nigirizushi is widely recognized as the original sushi. It is interesting that initially people didn't eat sushi rice. The Chinese hieroglyph for sushi had the translation «pickled fish» and later became a common noun. 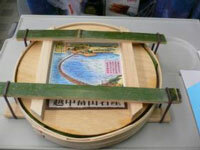 More than one thousand years ago, rice was used as preservative for long-term fish preservation. Fresh fish was cut into small pieces, sprinkled with salt, and mixed up with rice. Preservation allowed the fish to be stored up to one year. And only much later, around the sixteenth century, did people begin to eat this refermented rice. 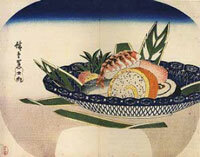 In the seventeenth century, it was already possible to see sushi similar to present kinds. By adding vinegar, there was no need to cook the rice for a long period of time. Rice or fruit vinegar was mixed up with salt water, sometimes sugar, mirin, sake, honey, and seaweed. This mixture was added to boiled rice and placed under the press with fish for a while. This dish became popular very quickly and was served everywhere in Japan. Nowadays there are more and more sushi recipes. The dish changes under local standards in different countries becoming truly international. The world popular California roll with rice on the outside was created in Vancouver in 1971. The unusual appearance of seaweed was frightening for people and the Japanese chefs used a trick — they turned a roll inside out, with the rice on the outside. This roll was very popular in Los Angeles and was known as the California roll. In turn, the Philadelphia roll got its name due to the cheese by the same name, one of the main ingredients.